Every inch of this D110 is enhanced for adventure. At first glance, this station wagon emanates a classic look with Fungus green bodywork, satin black chequer plate and traditional steels. However, the off-roading aficionados amongst you will notice that everything about this Defender is there for a reason. The OEM steering wheel, powerful V8 engine and BFGoodrich® AT tyres are perfectly suited to provide superior leverage and handling. 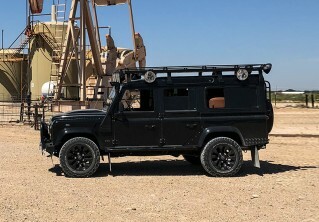 The designer of this truck knows Defenders inside and out and plans to use it for what it was built for. Aided by a NAS exterior roll cage and WARN® winch, this station wagon will hold its own on the Florida trails, just like its Native American namesake. Check out OSCEOLA D110 Edition here or contact us for more information.